The Melville Fire Department responded to a multi-vehicle crash on the North Service Road and Round Swamp Road on January 21, at 3:47 p.m. 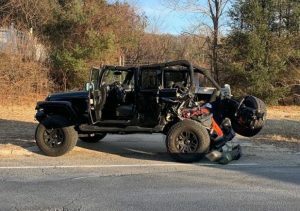 The chain reaction accident occurred when a tractor-trailer traveling west on the North Service Road apparently lost its brakes and rear-ended a Jeep, injuring a nine-year-old girl and her parents and causing significant damage to the vehicle. The family was transported to Huntington Hospital with non-life threatening injuries. The truck continued going and struck two other cars before coming to a stop approximately 1,000 feet west on the North Service Road in Nassau County. Melville FD volunteers were on the scene with two ambulances, a heavy rescue truck, engine, quint, fire police, paramedic and first responder units, all under the direction of First Assistant Chief David Kaplan. Both Suffolk and Nassau police responded to the incident.